This week, as many of us are gearing up to get back into the routine of school, I thought I would share a bit about our quest to develop good dinnertime traditions. We fell off the wagon a bit this summer, and we’re really trying to get back into the routine of not only eating together at the table together, but of making use of the time as a family bonding experience. Dinners with four small kids can be hectic, and sometimes it feels like more work than it’s worth. But this is one of those long-haul practices. I’m hoping the time I’m putting in now to develop mutual enjoyable family meals will mean they will want to come back to them as adults. Thank you for the world so sweet, Thank you for the food we eat. Thank you for the birds that sing, Thank you God for everything. Let us think thrice while we are gathering here for this meal. First, let us think of the people we are with today, and make the most of the pleasure of sharing food and drink together. Then, let us think of the people who made the food and drink and brought it to us, who serve us and wait on us, and who clear up and clean up after us. Finally, let us think of all the people all over the world, members with us in the human family, who will not have a meal today. We receive this food in gratitude to all beings Who have helped to bring it to our table, And vow to respond in turn to those in need With wisdom and compassion. 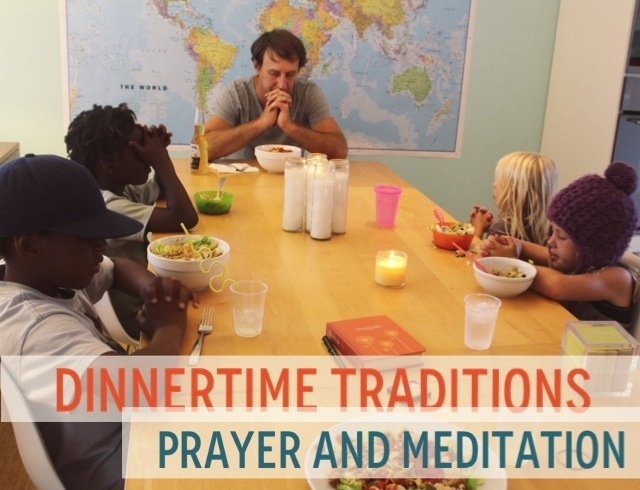 Do you have a prayer or meditation when you begin a meal?